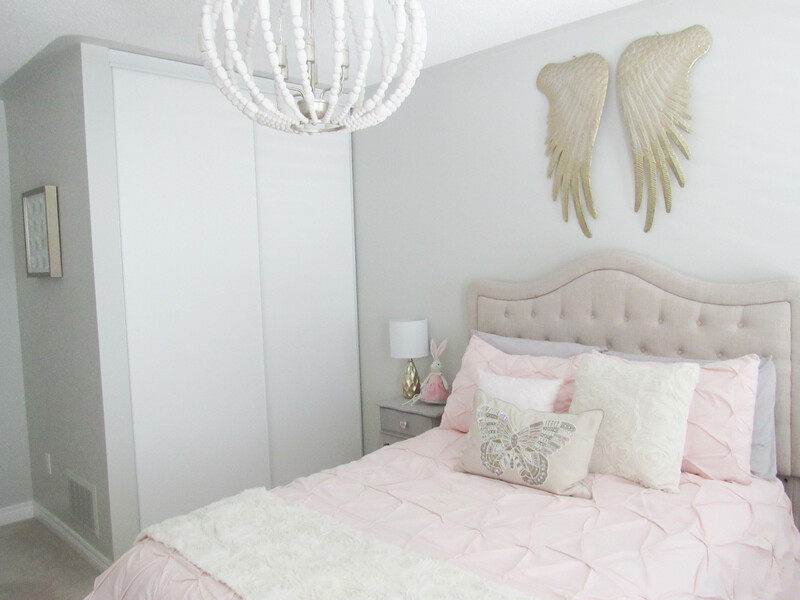 Ashlynn’s big girl room is finally complete, and I am so excited to show you guys how it turned out! 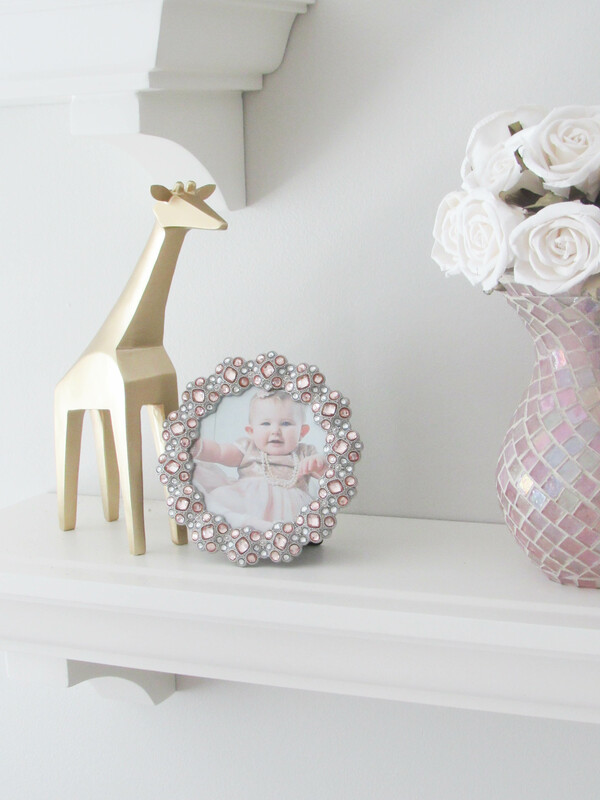 I had so much fun decorating this space, I can’t even begin to tell you. Since we didn’t find out the gender for both our kids, we had a gender neutral nursery. We painted the walls a soft green, and added accents of yellow throughout the room. 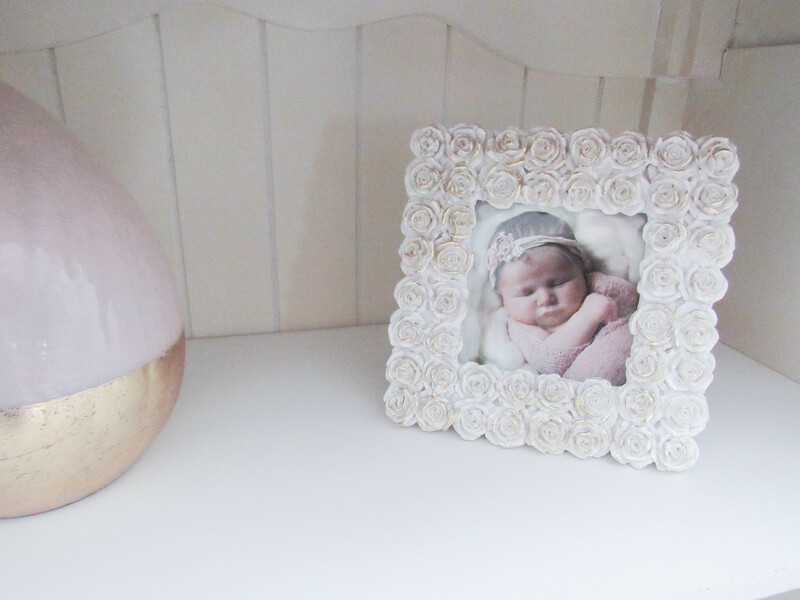 We used it for my son, and when my daughter was born we decided to keep the wall colour the same, and just switch out all the yellow, for pink. 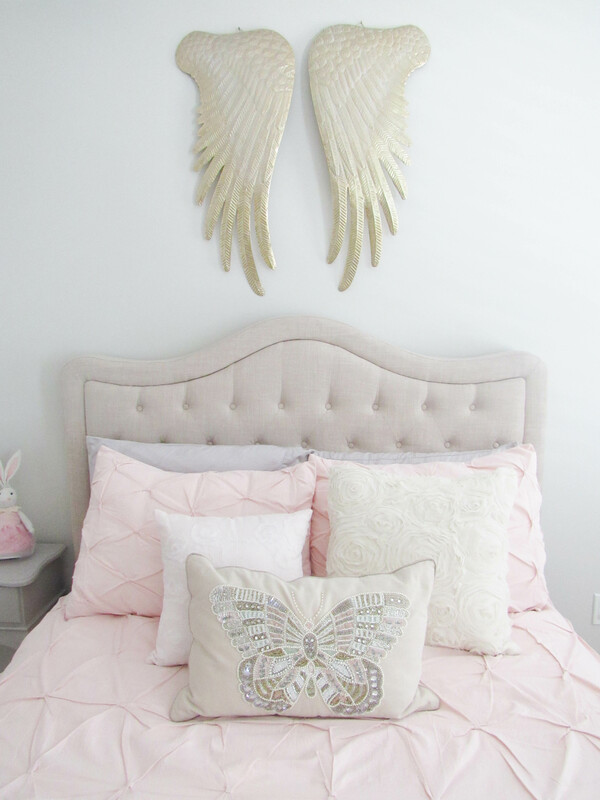 I just didn’t want to waste the money, and re-do the whole nursery when I knew I had big plans for her big girl room. 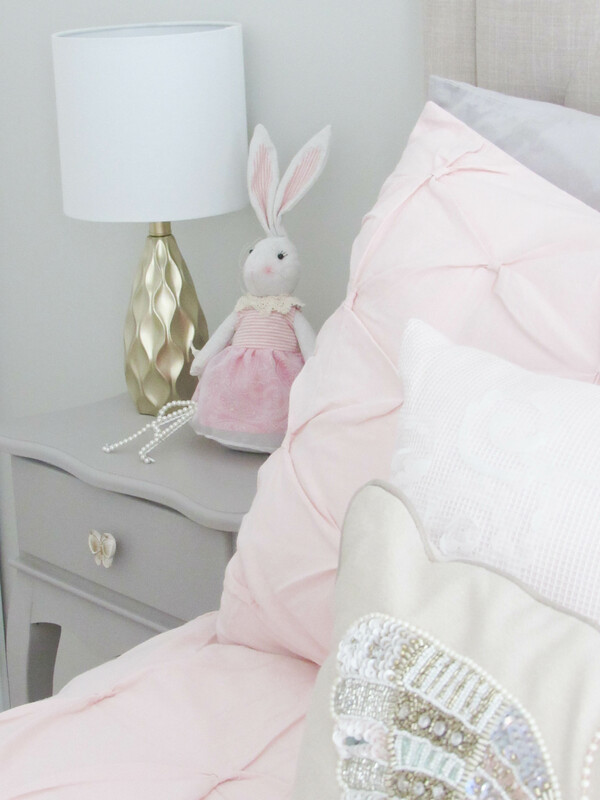 The moment I found out I had a girl, I already started dreaming about how I was going to decorate her big girl room. So here it is! It came out exactly how I envisioned it, and I couldn’t be more happy with the finished look! 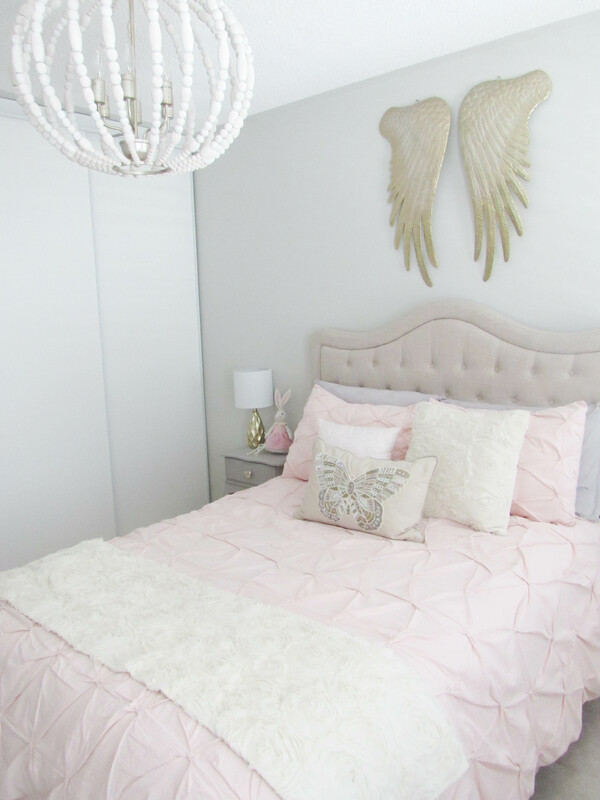 I wanted the space to feel very soft, light, and girly. So first off, I painted the walls a light grey using Behr Premium Plus Ultra in the colour Campfire Ash. 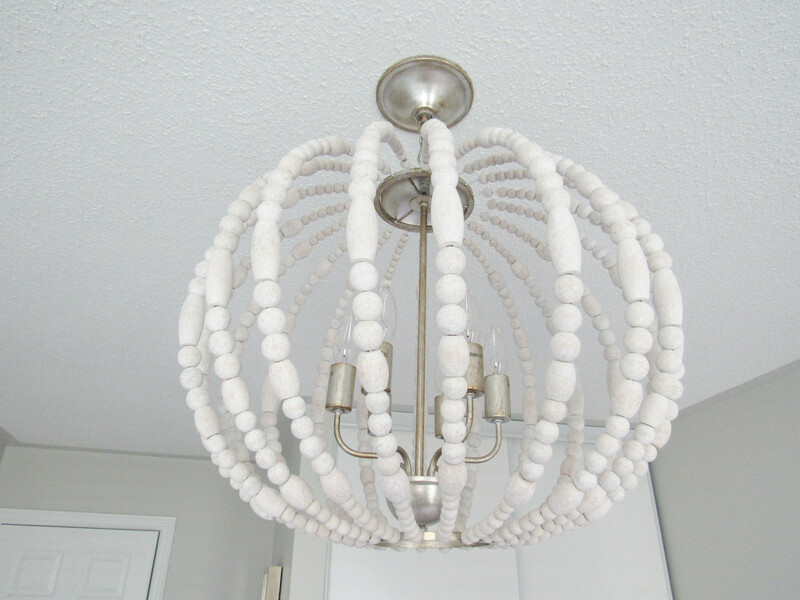 For lighting I didn’t want to put your average looking chandelier in her room, I wanted something unique, and different. 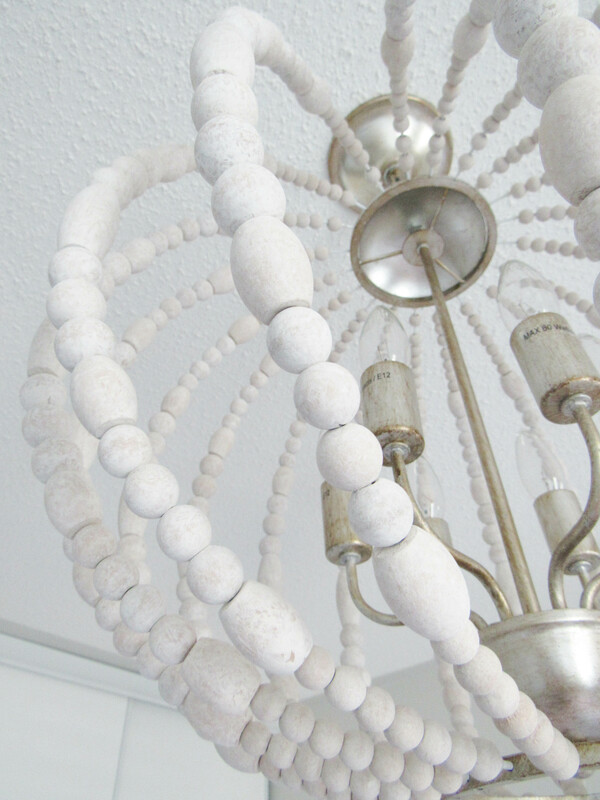 I found this gorgeous white washed wooden chandelier from Universal Lamp, and it couldn’t be more perfect! It was exactly what I had in mind. I found her upholstered bed on Wayfair. 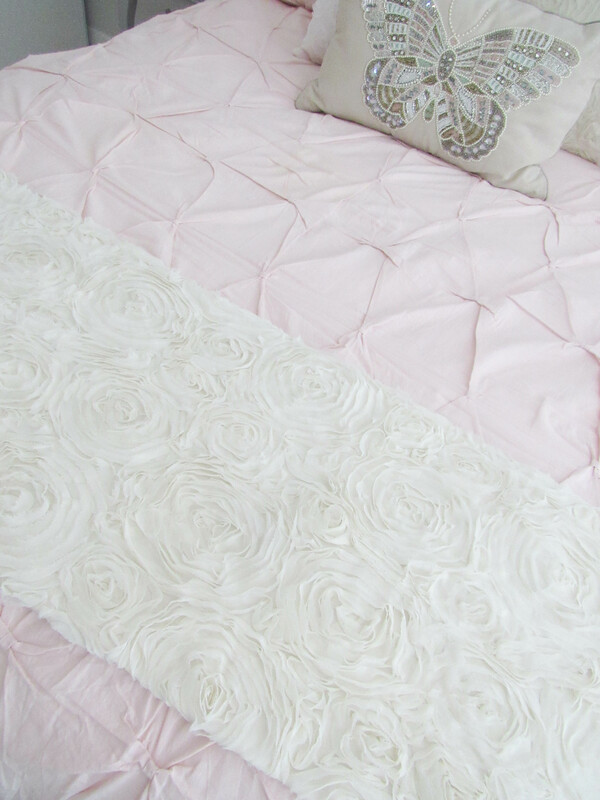 I bought a double bed in the colour beige which was nice and neutral. For her bedding I didn’t want anything juvenile looking. 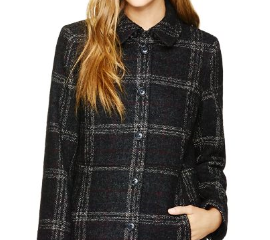 I wanted something that would grow with her, and look pretty, and feminine. 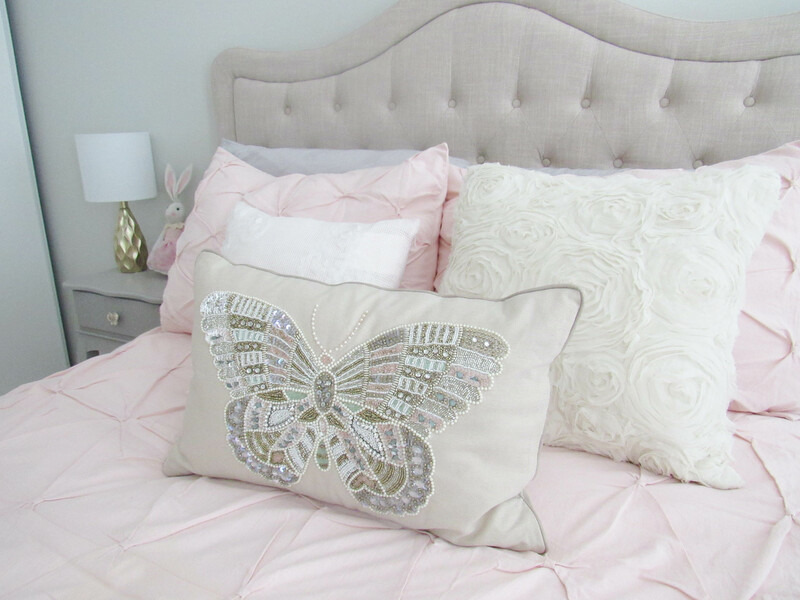 I went with the Pintucked Bow bedding collection from Restoration Hardware in the colour Petal. 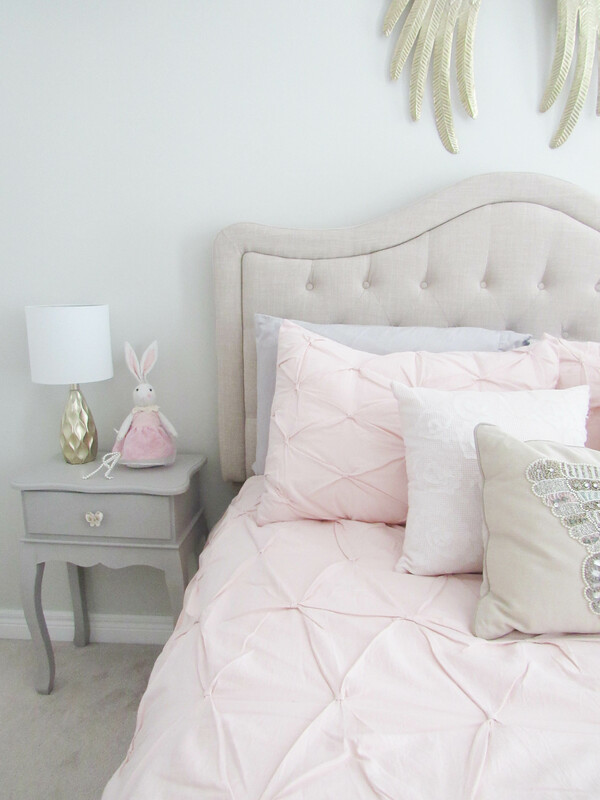 It’s the most beautiful, soft, light pink that looks so pretty against the fabric on the bed. 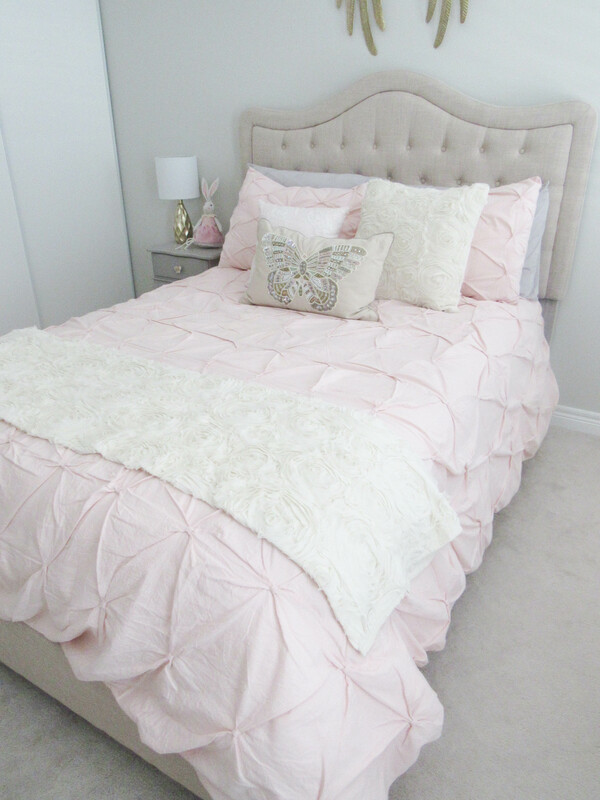 I also got this gorgeous Chiffon Floral Bed Throw from Restoration Hardware as well in the colour ivory. 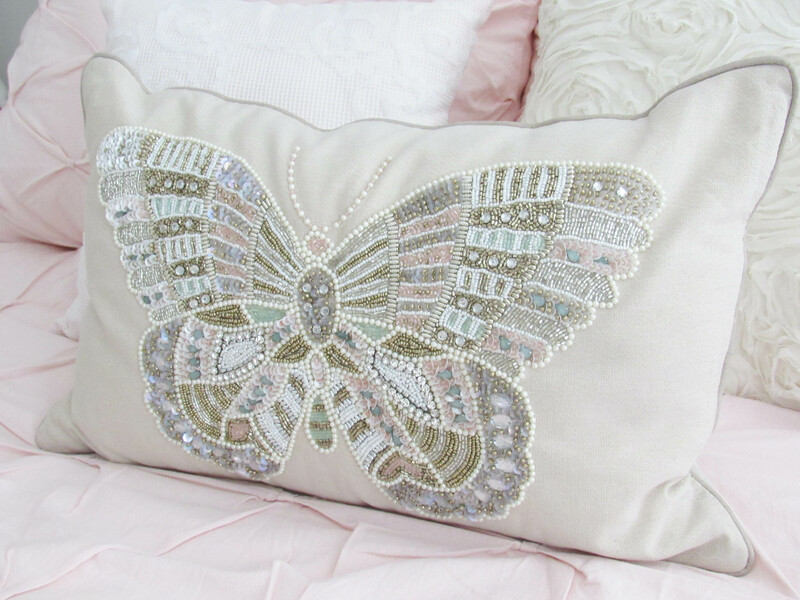 The pattern also comes in a decorative pillow as well, so I bought one as an accent pillow for her bed. 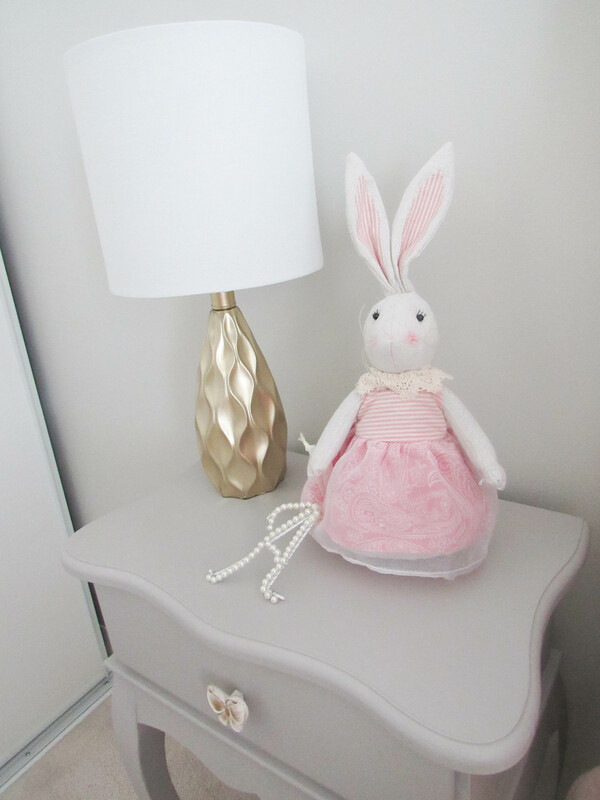 A lot of the little decor pieces in the room I got from Homesense such as the butterfly pillow, night table, lamp, bunny, and the butterfly artwork. 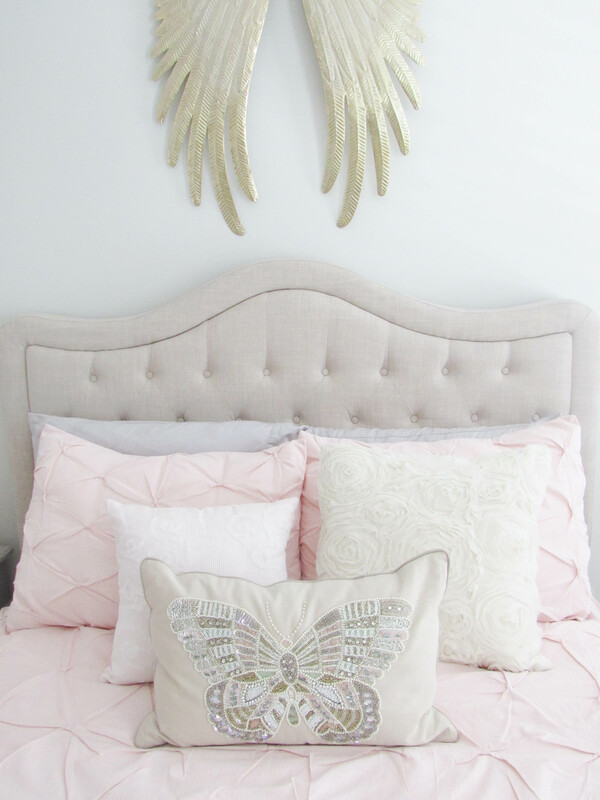 As you can see throughout her room, I added some gold accent pieces like the gold angel wings. 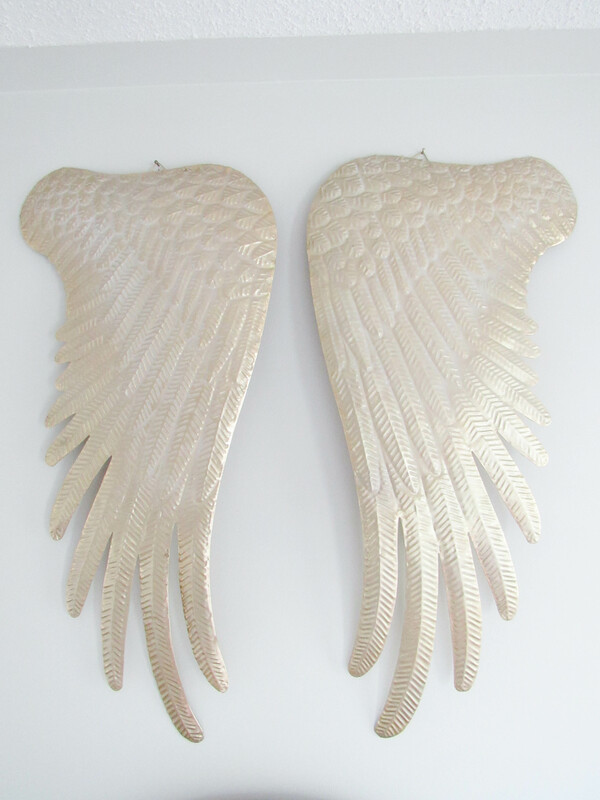 I found these from Michaels – which I thought would look really nice above her bed. 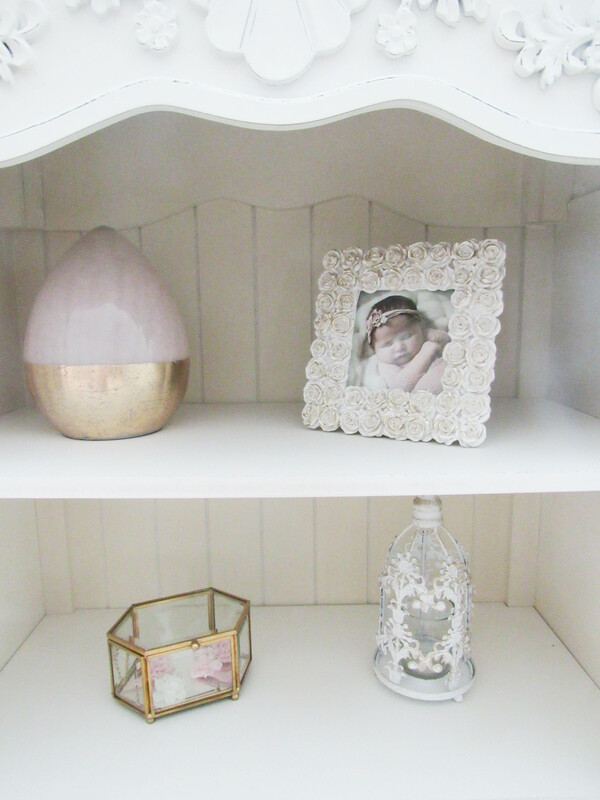 This white dis- stressed shelf is very sentimental to me. 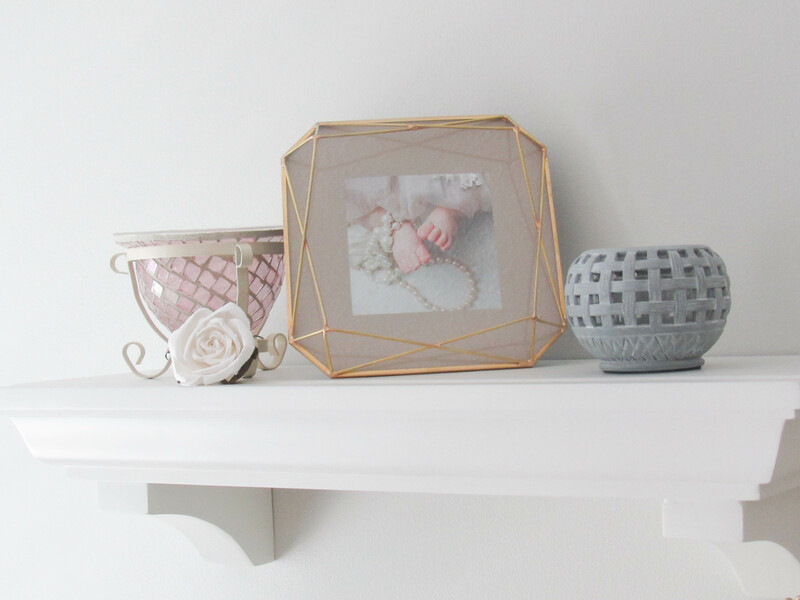 I used to own a flower shop before I was married, and bought this shelf to display home decor pieces that I sold in my store. 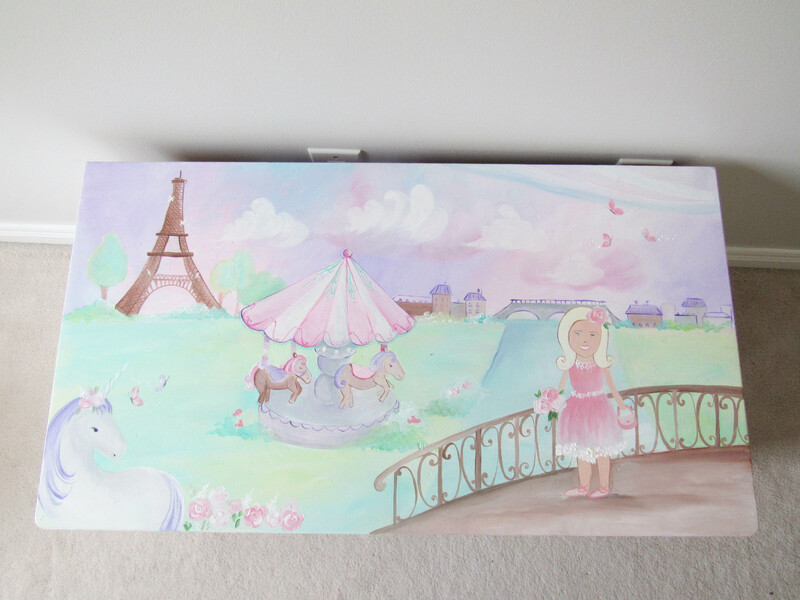 It was such a beautiful piece that I took it with me once I sold the store. 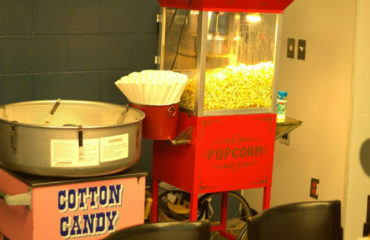 I had it in our basement for years, and finally found a perfect place to use it. 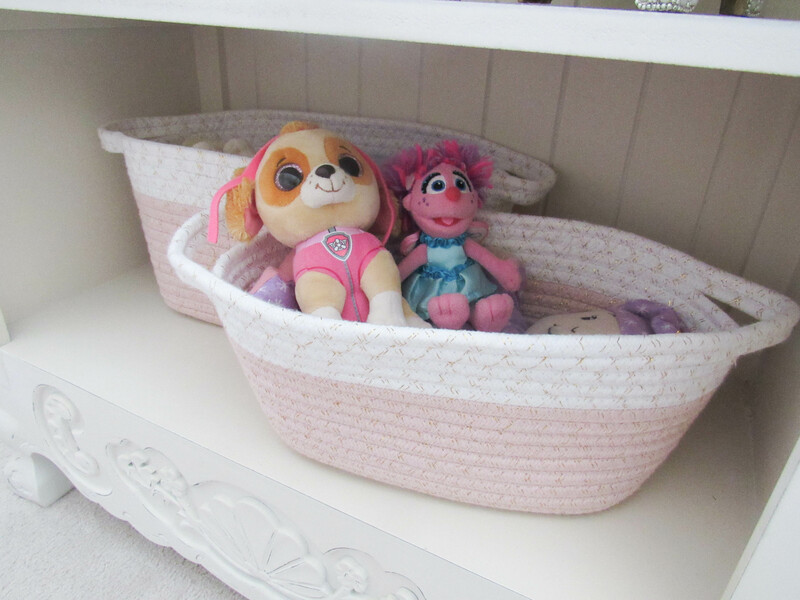 This shelf looks so pretty in this space, and holds all her jewelry boxes, stuffed toys, etc. 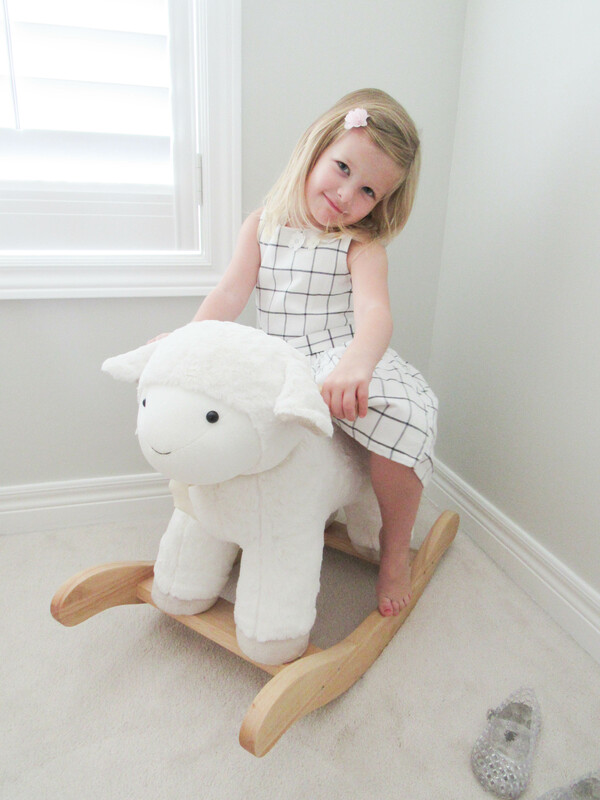 The Lamb Rocker I purchased from Pottery Barn Kids when she was born. She just loves rocking on it every time she goes in her room. 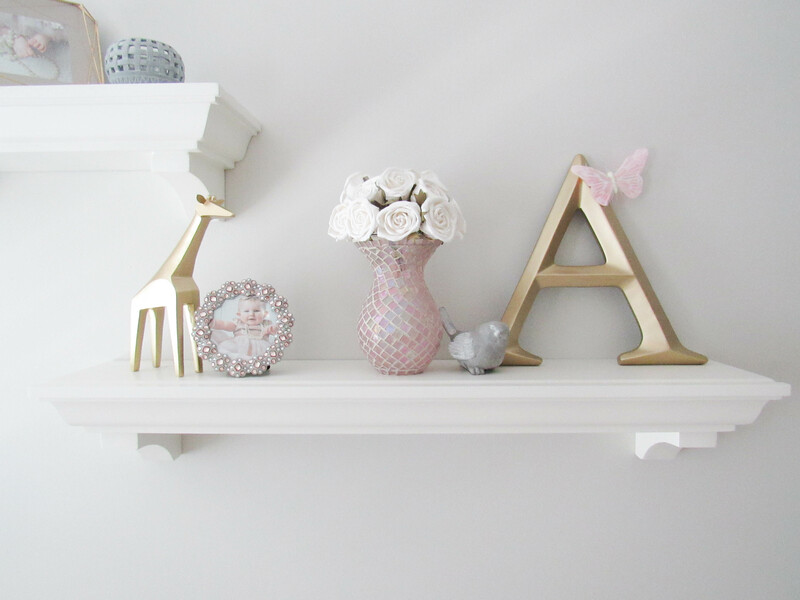 The 2 Wall Shelves and the 3-Shelf Bookrack were also both from Pottery Barn Kids. 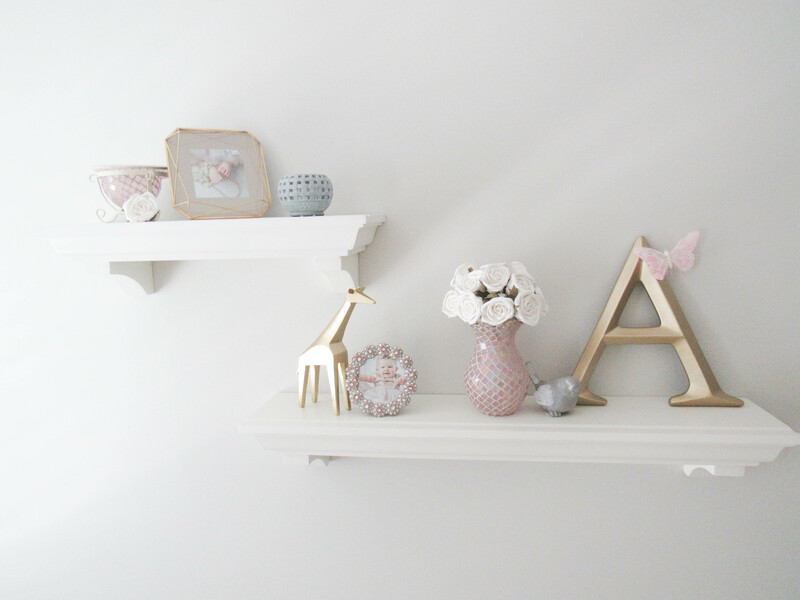 The wall shelves come in 3 sizes- I got the 3” and the 4” in the colour simply white. The 3-shelf Bookrack is great because it doesn’t take up any space in the room, and holds a ton of books. Another sentimental thing in her room are the cream flowers in the vase on her wall shelf. Those flowers were actually on my wedding cake. I had them sitting in a shoe box for almost 10 years, and thought they would tie in so nicely in the space. 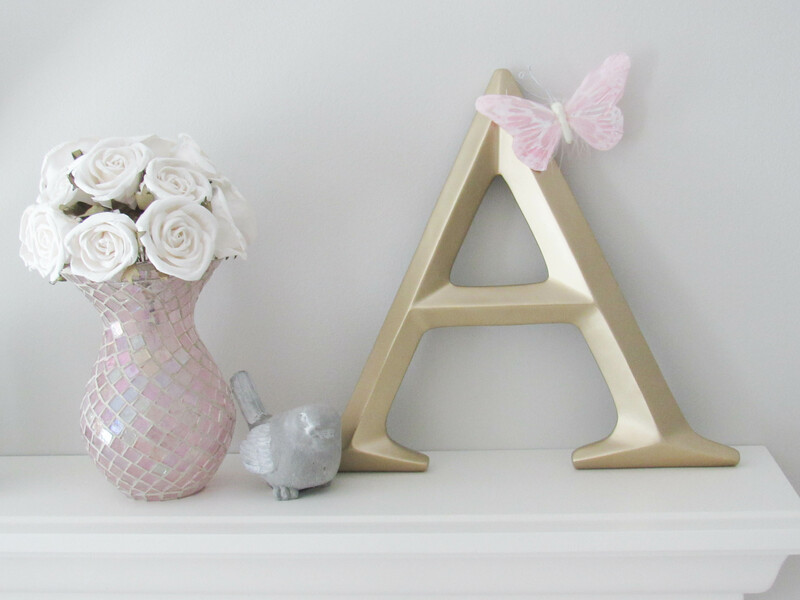 Her growth chart hanging on the wall was from Little Monkey Designs, and the letter A on her shelf is from Hobby Lobby. 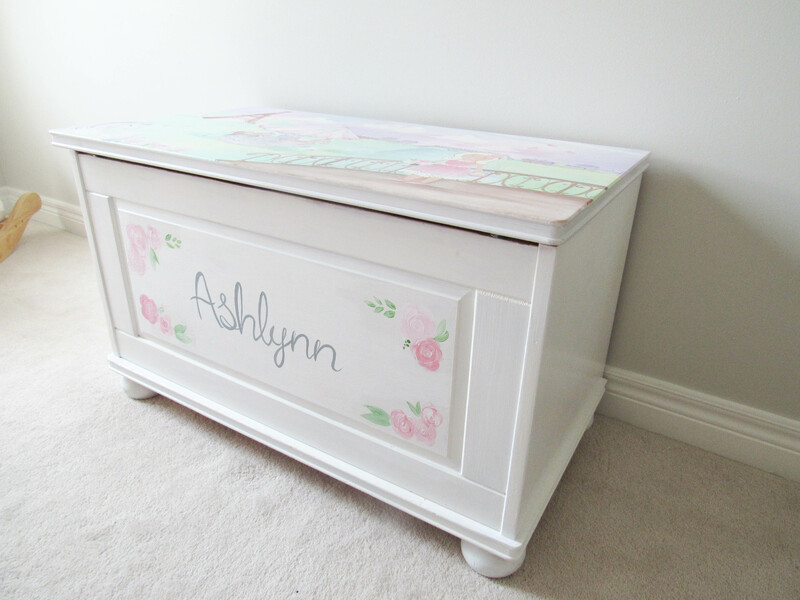 Probably one of my favourite pieces in the room is this custom toy box I had made from Whimsical Imaginings. 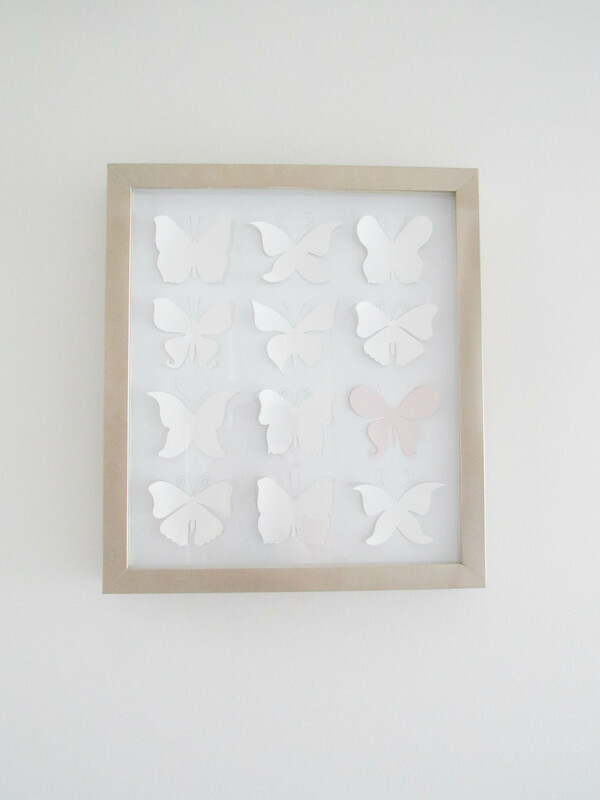 I got one made for my son’s room as well, and it’s a great keepsake item. 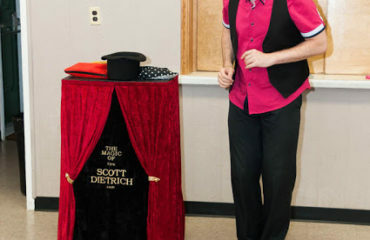 She does such an amazing job! 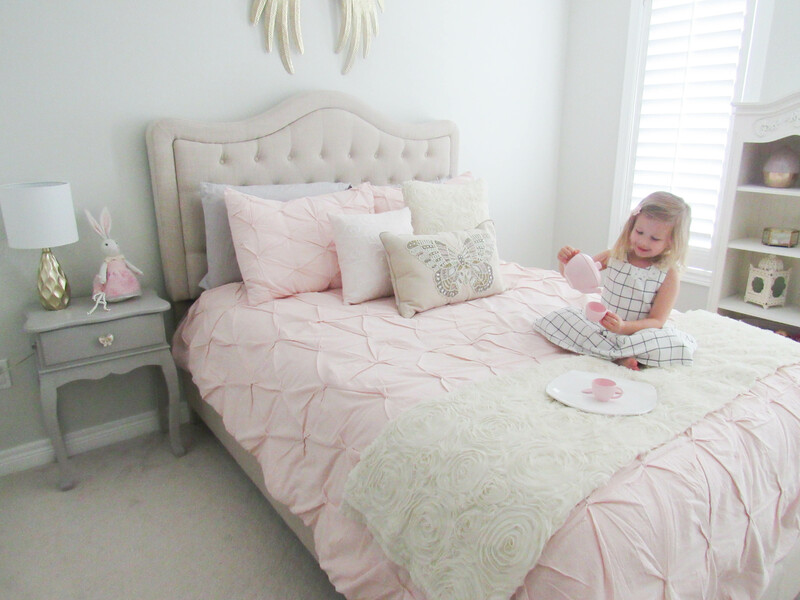 My little girl loves her new big girl room so much, and to see her all happy, and excited about her new room gives me so much joy. Disclaimer: Some items in this post have been provided to me for review, but all thoughts and opinions are my own.